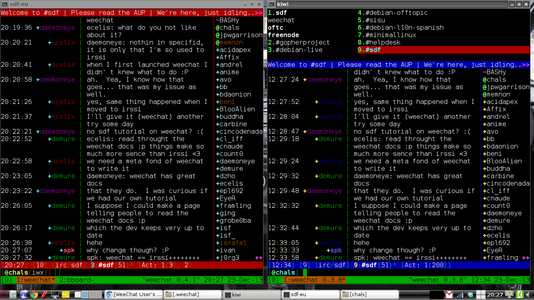 Since the relay is working so fine, I decided to take a screenshot of the weechat instance running 24/7 with the configured relay running in a remote server and the other one of my local instance running in my raspi. Just in case somebody is wondering why I run two instances of the same program both locally and remotely, the answer is plain simple. In my local instance I can configure and use as many plugins and scripts as I like whereas things are not so easy on the remote server. For example the aspell plugin which is really handy when typing fast or the buffersscript, just to name a few. I am not a web designer although you might think so looking at this site (Just joking!!!). I am a language expert or at least my degree says so. I admire the work of William Blake. I am the former president of ASC. A wireless internet association.